Hello friends! Do I have a big treat for you today! If you’re searching for a style ‘roadmap’ to use as inspiration for your home decor, look no further! 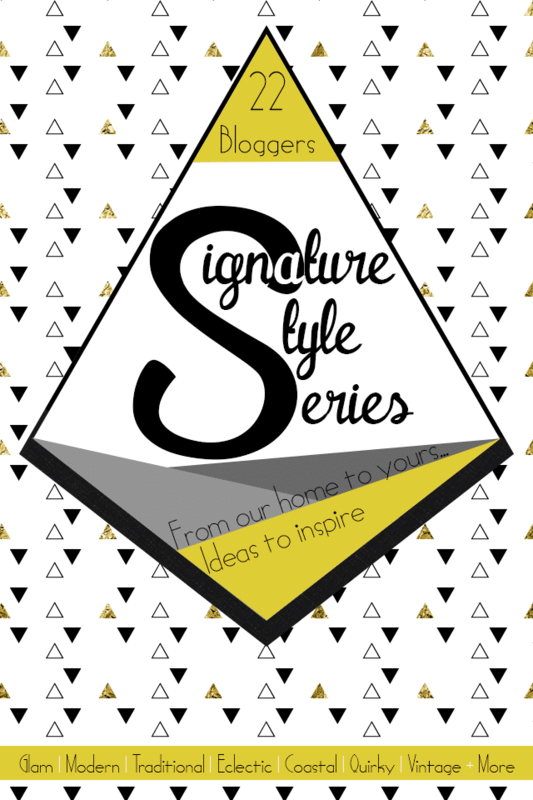 My creative and talented friend Carrie at Making Lemonade is hosting a ‘Signature Style’ Design series this week showcasing the Signature Design Style of 22 talented Bloggers! I’m so thrilled she asked me to join in and share my design style favorites and signature decor looks! 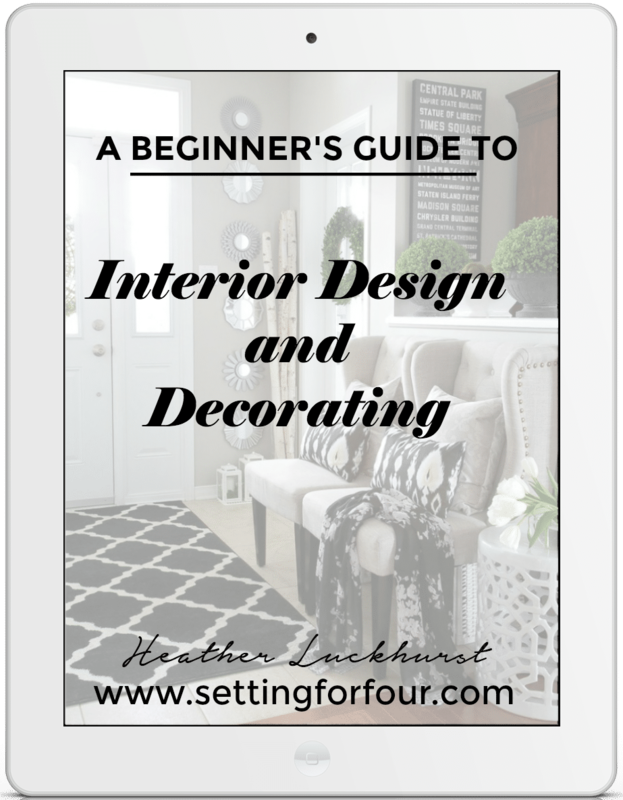 Today is day 2 in the series – if you’ve hopped over from my beautiful friend Darlene’s blog at Fieldstone Hill Design – welcome to Setting for Four!! Isn’t Darlene’s Glam Farmhouse Signature Style ga-orgeous??!! My style has definitely changed over the years and has evolved to my current Signature Style: Rustic Glam Casual Elegance – a mixture of traditional, clean contemporary looks in a casual family friendly setting topped off with a touch of glamour and casual elegance! 1. 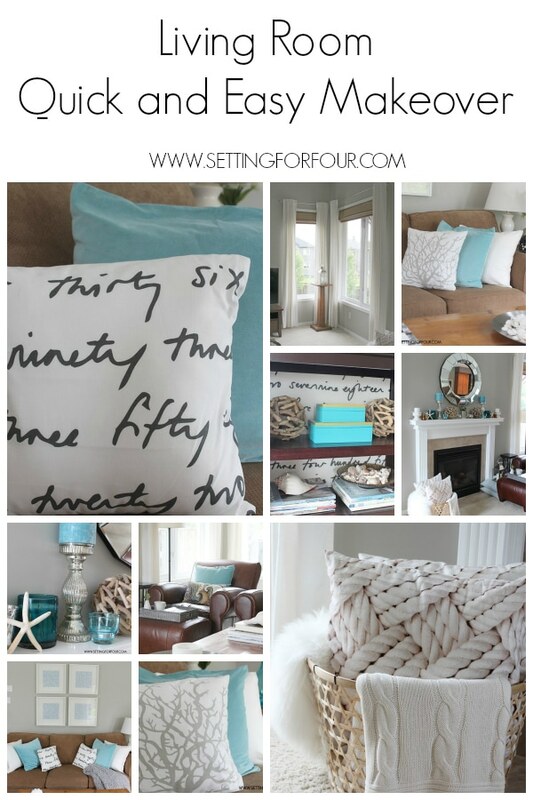 My Living Room – casual living with a coastal color palette and a sparkly mirror! 2. 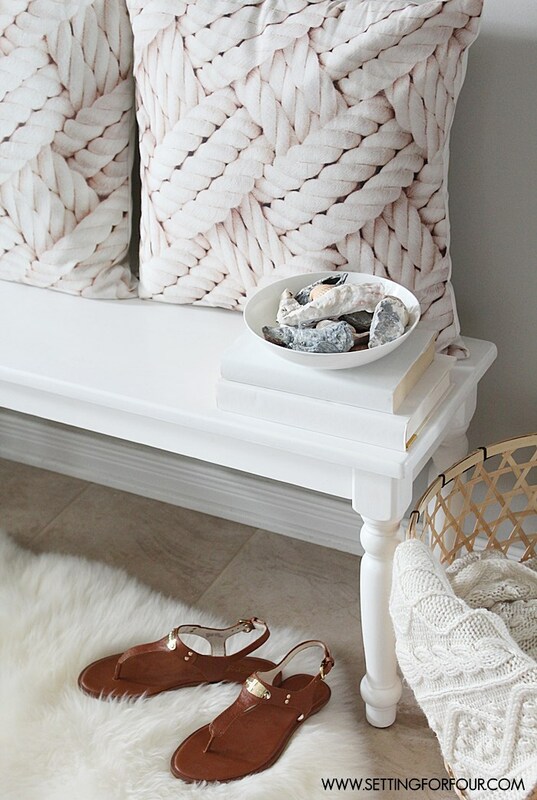 Barbara Barry Poetical Bedding – this is my bedding….bedroom makeover to come, stay tuned! 3. 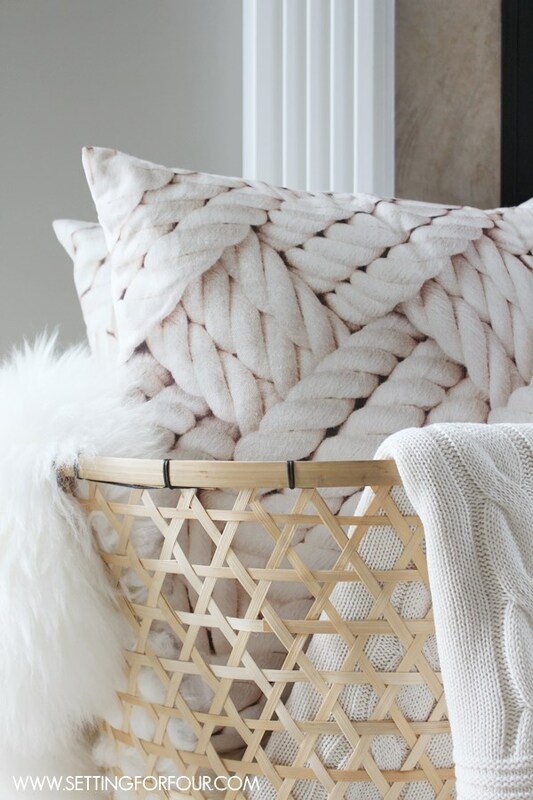 Cozy accents – including a cutwork basket filled with a sheepskin throw, pillows and a throw. 4. Black Riding Boots – I live in these from fall to spring… so comfy! 5. Ray-Ban Aviators… um, need I say more? 6. Michael Kors Watch….Dear MK: you make me swoon! 7. Rustic and metallic looks – rustic coffee table decor including an antiqued dough bowl filled with Virginia pinecones and an antique pulley. 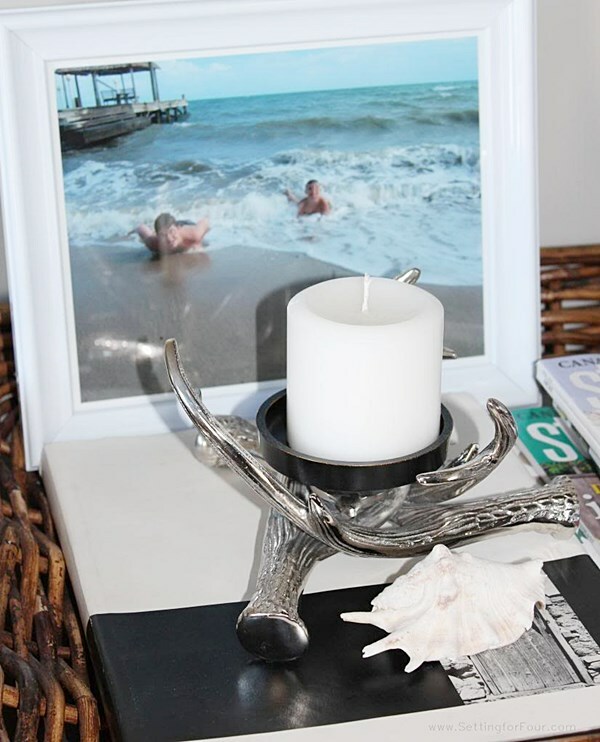 Silver metallic horn candleholders. 8. Sparkle and Shine – My living room mirror….- an exact look-a-like to Z Gallerie’s Portico Mirror without the expensive price tag! 9. 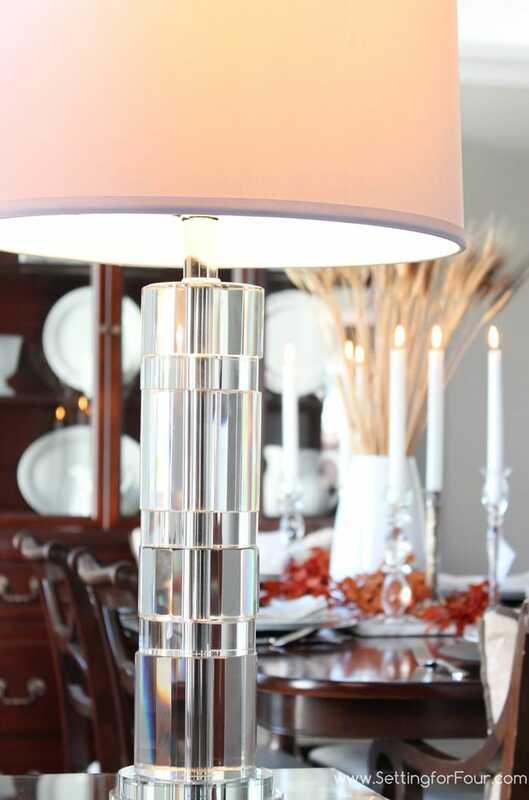 Glam decor – luxe Ralph Lauren Crystal table lamps that I scored for a great price at HomeSense. 10. Sherwin Williams Eider White 7014 – our boys’ bedrooms. 11. Sherwin Williams Mindful Gray 7016 – my living room, dining room, family room, foyer, guest bedroom, one wall in our laundry room and guest bedroom. 12. Sherwin Williams Mink 6004 – in my kitchen. 13. 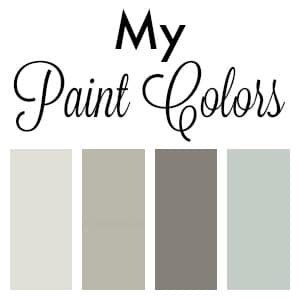 Sherwin Williams Rainwashed 6211 – what I have planned for my bedroom makeover. 14. 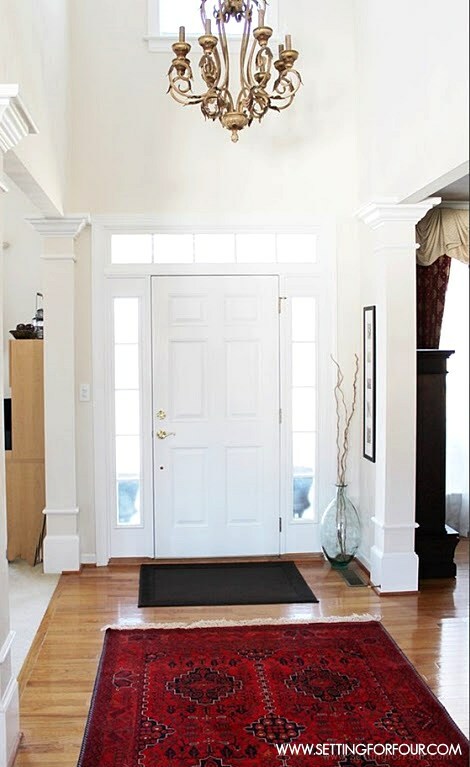 Sherwin Williams Weathervane 2927 – my front door color. 15. Sherwin Williams Toque White 7003 – my laundry room color. As a military wife – I’ve moved…. a lot. That means I’ve had to define my decor style over many moves and years to fit many different homes, room shapes and types of rooms without buying new furniture and accessories for each home we’ve lived in. The constant throughout all of those military moves and homes that allowed me to create a decorated cohesive look is my design style: Rustic Glam and Casual Elegance. 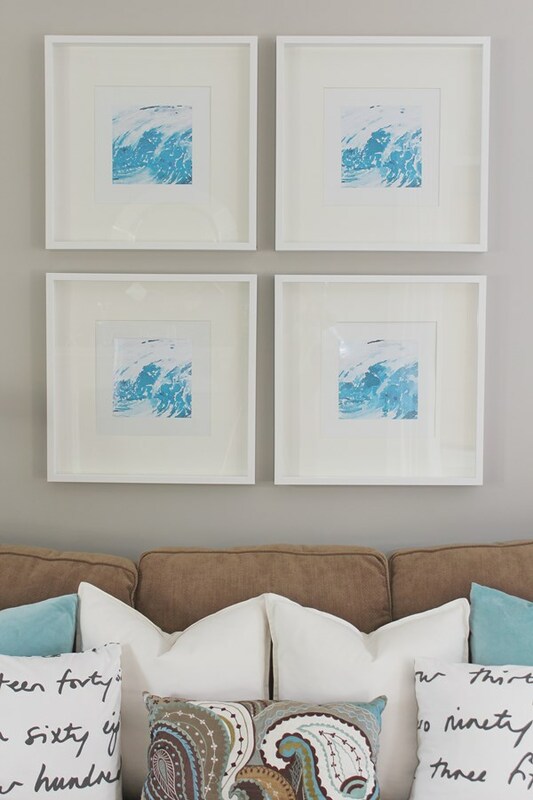 My Signature Style has developed from growing up on a clear northern lake where my love of watery blues, driftwood greys and sandy taupes began. Our home is a loving collection of layers and meaningful memories of…. On top of all of that I love to sprinkle on some shimmer and shine! Like my Ralph Lauren Crystal Table Lamps I scored at HomeSense for a bargain! I also love to scour thrift store and antique stores for unique finds! …I’m also passionate about DIY’ing! DIY Restoration Hardware Inspired Custom Farmhouse Table with Bolted Plank Top and Salvage Grey Wash Finish – I custom designed this table combining two RH table styles for a one-of-a-kind look that only cost $157 to make compared to the $4690.00 RH price tag! Woot – love the $ savings! 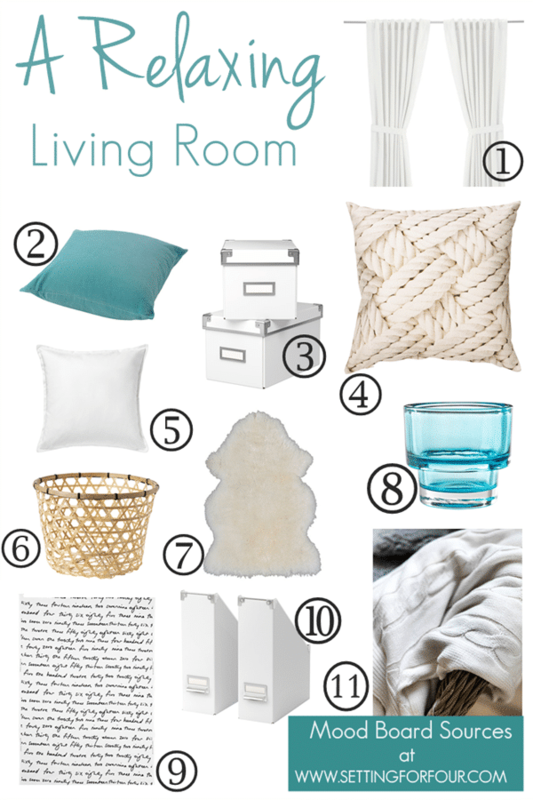 …..and as an Interior Decorator I love, love, love to create Mood Boards! That wraps up my Signature Style – I hope you enjoyed getting a peek into my Decor and Design passions! To continue on the #SignatureStyle series tour click on over tomorrow to my sweet friend Jessica’s blog at Decor Adventures! Be sure to check out all of the amazing decor inspiration in this series including vintage, eclectic, cottage, modern, glam and more! 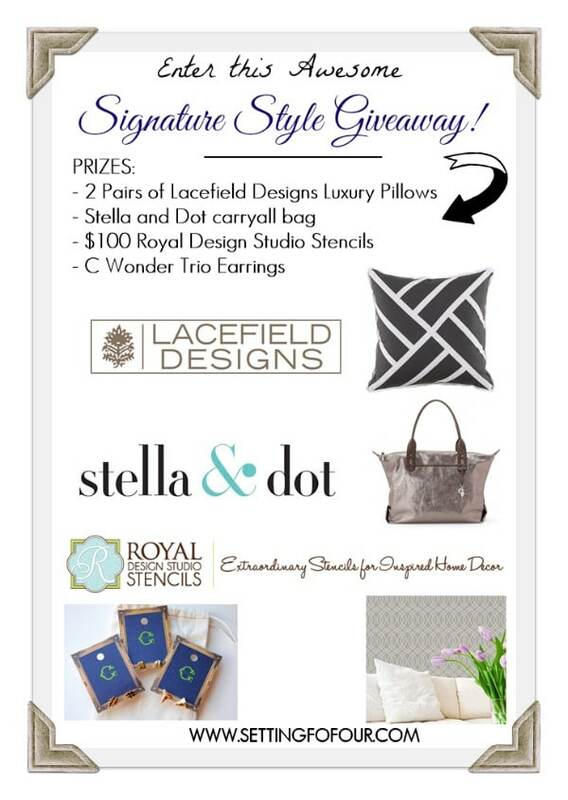 …..and be sure to enter the INCREDIBLE Signature Style Giveaway that you won’t want to miss! 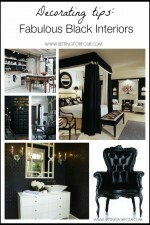 Now You Can Have Black Interiors that are Bold not Bleak! Hello friend! This post is like the best of all the things you love, it’s great! I love seeing all the elements people bring together in their homes, and that you mentioned how many of yours are meaningful – I feel the same. Glad to be on the tour with you and hope all is well! Thanks Jessica for your sweet comments! I’m so glad to be joining you in this series too!! This post was soooo incredibly fun for me to write and I love seeing everyone’s collected looks in the tour too!! You can come decorate my home ANY time. I love everything. And the MK watch . . . yes! That was on my style sheet too, lol. This is so fun finding new blogs. You’re so sweet to say that Jo-Lynne thank you for your lovely comments!! I’m heading over to your house to help you decorate! 😉 I agree, I love discovering new talented bloggers like yourself as well! I love everything, Heather. Its so beautiful! 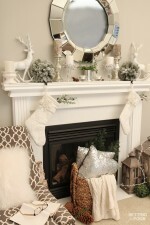 I love the mirror above your fireplace – its gorgeous! Thanks Jenna! That mirror makes me smile every time I look at it! So fun to join you in this design series!!! 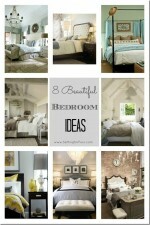 you have such a beautiful home- i love the glam and cozy mix! 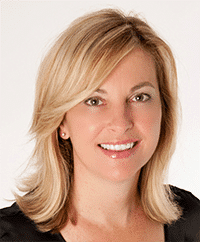 Thank you Cassie – I so appreciate your lovely compliments on my home! I am so passionate about creating a cozy nest for our family! Love your signature style board is so pretty. Totally love your style. I really like how you’ve combined elements from each of the styles you like into something unique and all your own. 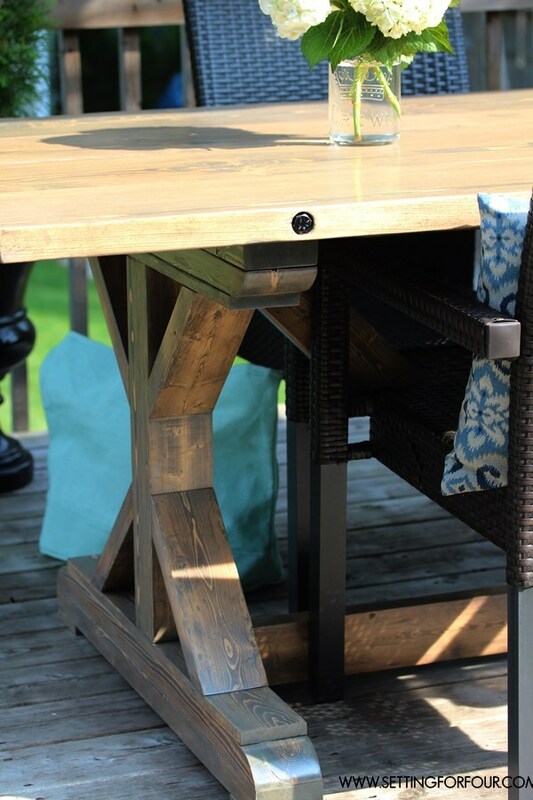 And your farmhouse table…fantastic! Thanks so much Tash – we have had lots of wonderful meals with friends and family on our DIY RH farmhouse table! Heather…just beautiful! I need to come have coffee…… 😉 xoxoxoxox Miss you! Yes come over anytime Daune- Miss you too! Thanks for your comments! Oh I love your style and your inspiration boards!! That sounds like a fun series, looking forward to checking out some more Signature Styles around too! 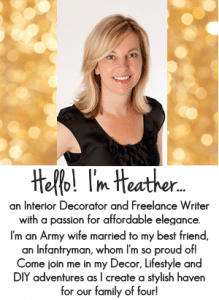 You’ll love this series and find lots of tips I’m sure Heather! Your rustic, elegant style is lovely. Your living room is just about perfect! 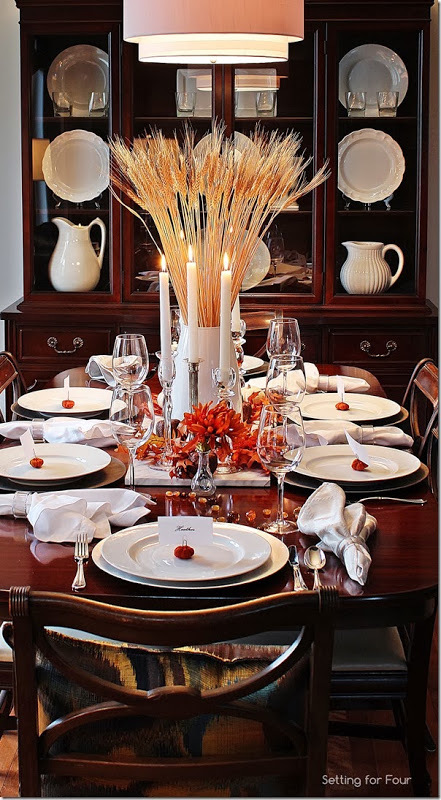 And that fall dining room, oh my!! Great post – there is so much to love here! I also live in boots most of the year. And I still have the ray bans I bought in my 20s – I guess they’re vintage now, yikes! Thanks Dani! Vintage Ray-Bans are so cool! Thanks for your compliments – I’m glad you enjoyed my post! 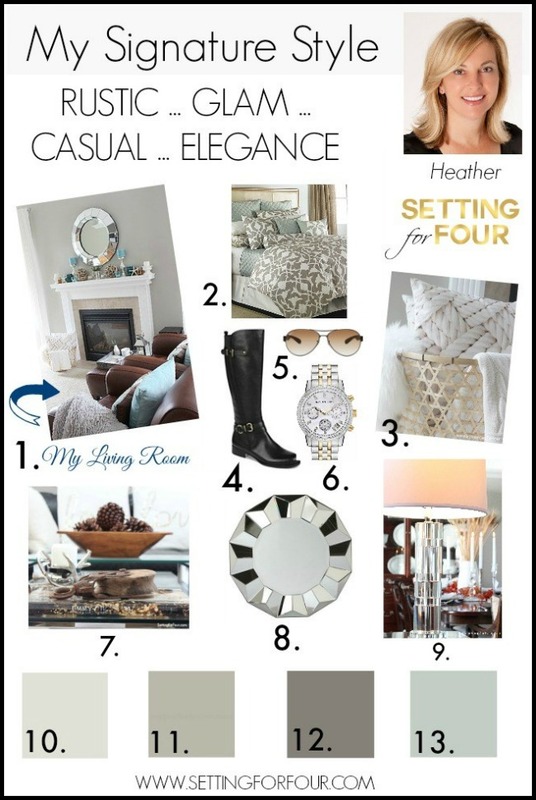 I absolutely love the mix of rustic and glam with so much blue- you have such a beautiful style, Heather!! Gorgeous home and style, Heather! I love the rug your hubby brought back from Afghanistan and your crystal RL lamps! So glad to have done this Signature Style tour with you! Thanks Jen for your sweet compliments! The reds and blues in that rug are so rich and gorgeous! I’m so thrilled to join you in this Signature Style tour too! Hi Heather, I found you while looking for the perfect gray for our new home. We are painting our open house plan Mindful gray and I saw your pictures. This finally sold me I was going the right direction. Your home is beautiful. I am trying to decide on Trim and Ceiling color. Can you tell me what you went with? Hardest part with choosing mindful gray is making transition to the other rooms with color. Should I stay with the same color card for all the rooms, or do you think its okay to venture into some hints of blue in rooms not directly connected to the open dining, kitchen, living. Thanks so much. PS. Enjoying your site! Hi Suzanne! Thanks so much for your lovely compliments on my blog and home! I’m so glad you are going with Mindful Gray – it’s a gorgeous color that I consider a neutral that compliments so many accent colors! We didn’t paint our trim and ceiling – since it was in great condition we left it as is from the previous owners. Our trim and ceiling color is a pure white if that’s any help! 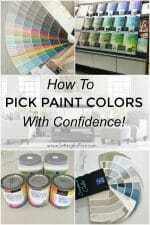 I had the pleasure of meeting the HGTV color expert for Candace Olson’s show ‘Devine Design’ – Andrew Downward – and he passed on some fabulous color and painting tips in my post here: https://www.settingforfour.com/2013/07/the-best-painting-tips-from-paint-expert-andrew-downward.html I think if you love blue you could add those to rooms that are not directly connected or stay in the same color card! Either would work! Everything looks brilliant ! I love the painting of the Horse. Can you tell me where you purchased it. Hi Vicky -Thank you!! I bought the horse art at Home Goods a while ago…..here’s a similar horse art piece that I absolutely love (affiliate link) http://rstyle.me/n/bwjubd27qn.